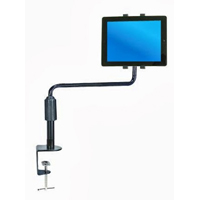 The Aidata Tablet Desk Clamp is an affordable accessory which provides some adjustment for tablets, iPads and eBook readers. 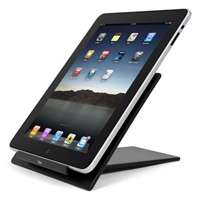 It will accommodate most flat devices which range in width from 6.18" - 7.5" (15.7 cm - 19 cm). The tablet can be adjusted along the included pole from 9.84" - 13.8" (25 cm - 35 cm) above the mounting point. 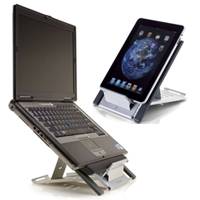 It is capable of horizontally extending the tablet 11.8" (35 cm), and will clamp to any solid desk up to 2.4" (6 cm) thick. 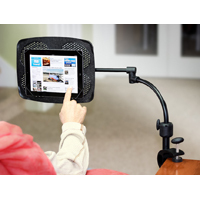 The Aidata Tablet Freestanding Mount is an affordable accessory with a weighted base which provides some adjustment for tablets, iPads and eBook readers. It will accommodate most flat devices which range in width from 6.18" - 7.5" (15.7 cm - 19 cm). 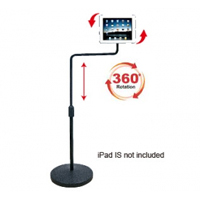 The tablet can be adjusted along the included pole from 33.7" - 48.7" (85.5 cm - 123.5 cm) above the mounting point. It is capable of horizontally extending the tablet 11.8" (35 cm). 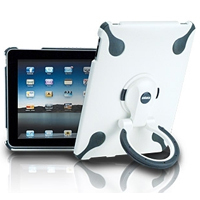 The Spinstand Multi-function Stand for iPad from Aidata is a lightweight and portable stand for holding and displaying your iPad either in hand, on your desk, or by hanging. 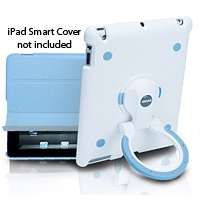 Made of durable hard plastic on the outside and soft rubber on the inside, it is easy to assemble and configure. 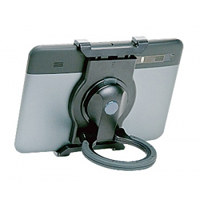 The Universal Tablet Suction Stand from Aidata securely holds a wide range of tablets (7" to 10") onto smooth surfaces such as walls, cabinets, desks, and glass using a silica suction cup. 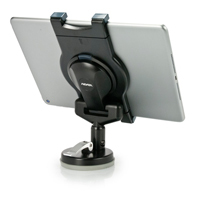 The tablet holder gives 360° of rotation, 360° of swivel, and about 120° of tilt, so that the viewing angle of the tablet can be configured into almost any comfortable and ergonomic orientation. 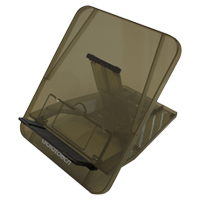 At about 4 lbs, this compact stand (11" x 13" x 5") is made of both plastic and metal and is available in black colour only.